The University of Chester’s state-of-the-art facility for the undergraduate study of BSc nursing (Adult Field of Practice) has been officially opened in the heart of the Wirral by the Lord Bishop of Chester, the Rt Rev Dr Peter Forster, in his capacity as President of the University Council (its governing body). 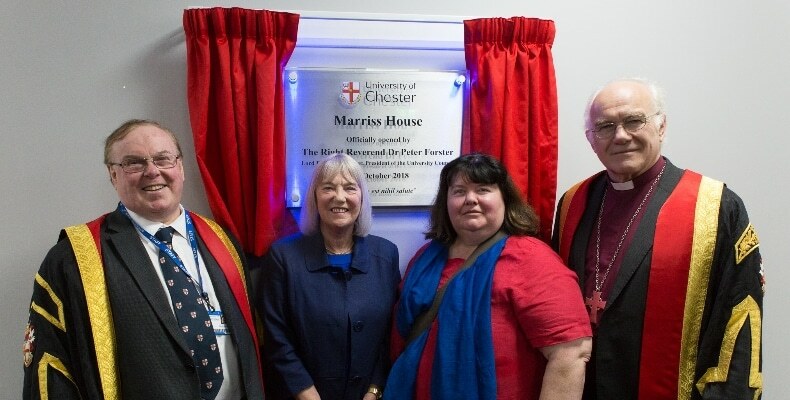 The former Old Market House in Hamilton Street in the centre of Birkenhead was renamed Marriss House after Professor Dorothy Marriss, who was the first Dean of the University’s Faculty of Health and Social Care and former Deputy Vice-Chancellor. Marriss House has already welcomed its first cohort in its Adult Nursing BN (Hons) programme to the new building. The programme is also delivered at its Riverside Campus in Chester, its Warrington Campus and at Leighton Hospital in Crewe. The adult nursing field cares for people over the age of 18 who are ill, recovering from illness or accident or adapting to life-changing disabilities or long-term conditions. Students on this programme learn how to prevent illness and assess the needs of the patient through acute and long-term illness, promote health and wellbeing, communicate effectively with professional colleagues and provide sensitive support to patients and their families and supporters. It took my breath away when the Vice-Chancellor discussed naming this grand facility after me. Professor Marriss’s association with the University started in 1991 when as Director of Nursing and Midwifery Education at the Countess of Chester, she was jointly appointed by the then Chester College of Higher Education and North West Regional Health Authority, with a remit to merge the Nursing and Midwifery schools based in Chester, Wirral, Crewe and Macclesfield and transfer the provision to higher education. The project was successfully completed in September 1992, at which time she became the Dean of the new School of Nursing and Midwifery, which then expanded to include Social Work and wider healthcare education. Dorothy’s management and leadership roles widened within the University and, in 2000, she became Deputy Principal and later Deputy Vice-Chancellor. IMAGE: Left to right: Professor Tim Wheeler; Professor Dorothy Marriss; Professor Angela Simpson and Rt Rev Dr Peter Forster.